Explain why Financial Services Cloud is easy to implement. Describe how Einstein Analytics leads to faster, smarter decisions. List Financial Services Cloud tools that increase productivity. Matt is confident he can get Financial Services Cloud up and running quickly. He can use the drag-and-drop feature in Lightning App Builder to provide his advisors with the most relevant information, tailored to the way they work. He’s tinkered with the standard objects and decided they won’t need much customization. The open APIs let him achieve seamless data integration. But that’s not enough, because productivity and customer satisfaction are the real measures of Matt’s success. Wealth management firms say their number one growth strategy is to make advisors more productive. Matt searches the Financial Services Cloud user interface to determine which tools can help boost advisor productivity. When Matt’s advisors get the name of someone interested in a new product or service, they want to track that name across multiple lines of business. Financial Services Cloud can help with intelligent need-based referrals and scoring. Matt researches a little more to see how it works. Referrals come from different sources, such as clients or their circle of influence or from different lines of business within an organization. 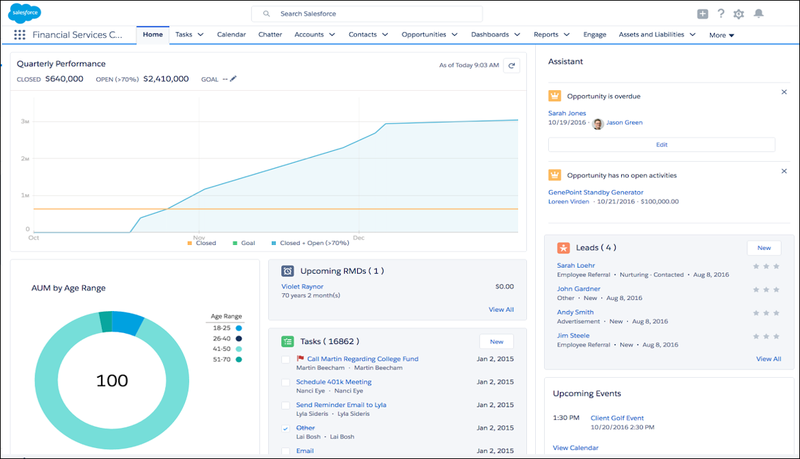 Once a referral is identified, the Salesforce workflow makes it easy to accept, assign, prioritize, and track. 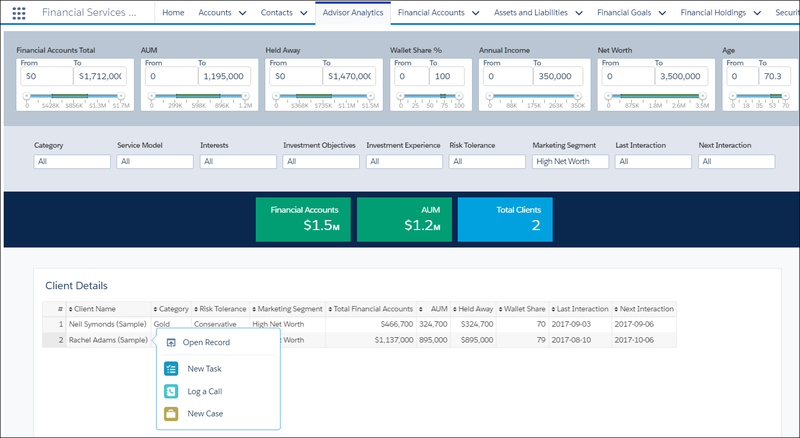 Financial Services Cloud works seamlessly with Einstein Lead Scoring. Over time, Einstein learns about referrals and referrers. Soon, Matt’s advisors can view scores indicating how likely a referral is to be converted. With this information, it’s a lot easier to prioritize the referrals who are most likely to convert. Referrers, too, have scores indicating the quality of their referrals. This score helps to prioritize referrals and also lets the business reward their most valuable referrers. He looks at his home page in Financial Services Cloud, which is where his advisors track their referral activity. He can easily see the advisor’s quarterly performance, the referrals assigned to that advisor, number indicating the likelihood of a referral converting, and more. Productivity cards on the home page highlight the most important tasks for Matt’s advisors. The cards include daily tasks, opportunities, and ranked leads. 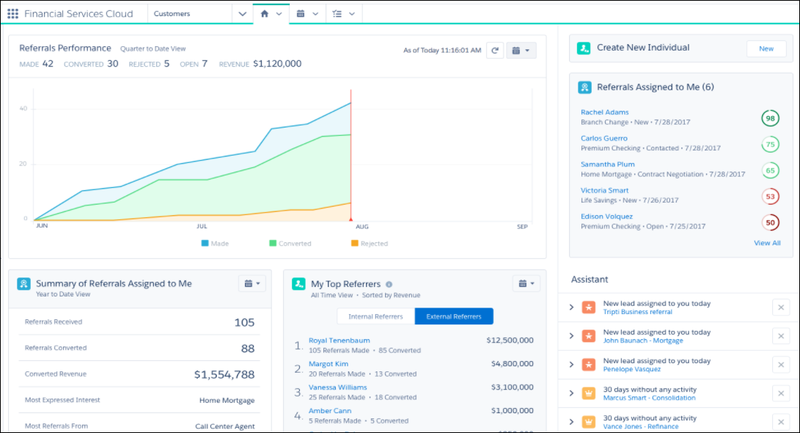 Financial Services Cloud uses its built-in intelligence to figure out what to put on those cards, such as client birthdays or upcoming calls or meetings. Advisors are guided into their most productive activities and can manage their day more efficiently. Matt’s a huge fan of automated and intelligent to-do lists—and he knows that his advisors will be, too. Matt is familiar with Salesforce Einstein, and Matt is happy to see preconfigured analytics dashboards embedded directly into Financial Services Cloud. His advisors can instantly segment their book of business to make more informed client decisions all within a single, integrated application. The dashboards surface key insights he can use to log a call, task, or event, and turn an insight into action right away. For example, there’s an 80/20 dashboard that helps Matt’s advisors to maximize their time. They can compare client revenue against advising activities and identify key actions to apply to high-potential clients. Below is a Client List dashboard that displays all the clients in an advisor’s book of business. For example, the advisor can choose to view all clients in a certain Category, such as Platinum, to make sure they are providing those clients with the expected level of service. This glimpse is encouraging. Matt can see how Einstein Analytics can help his advisors make smarter decisions. He starts checking out other tools that can increase their productivity, like dashboards. Now that Matt has seen the power of the Analytics dashboards, he’s intrigued. He dashes off to find more dashboards. Luckily, Financial Services Cloud has several dashboards to keep him happy (you can create even more). He finds dashboards that track critical business metrics to help keep everyone focused on the right priorities. For example, the My Book of Business dashboard can help advisors pinpoint their most and least valuable clients. In this dashboard, the second column shows the Most Valuable Clients by AUM (Assets Under Management). This advisor’s most valuable client is Rachel Adams. After the dashboards, Matt finds the in-context collaboration feature. Collaboration provides access to the right people at the right moment to make sure that the company is aligned. Once collaboration is set up, anyone in the company can ask inside experts for help with complicated questions. Matt can also create online communities to allow customers to work together. 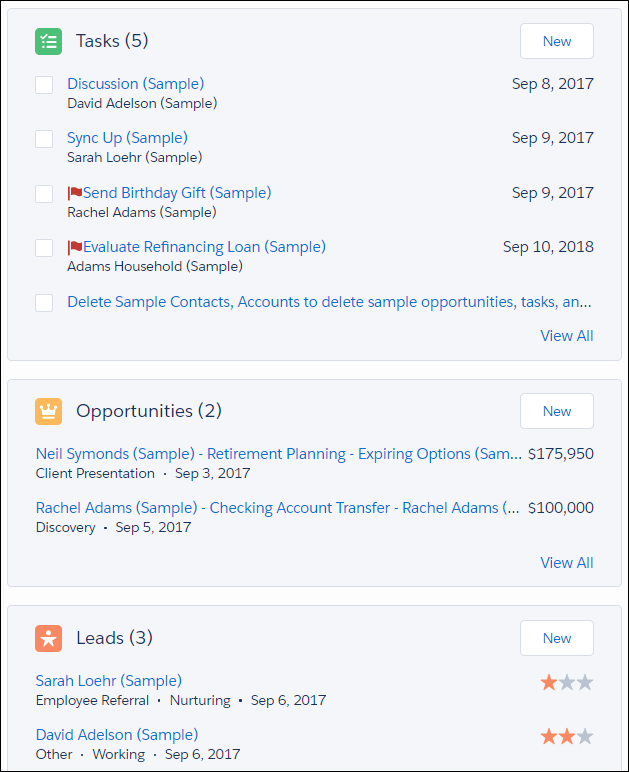 Matt looks at all the pieces again in a sample home page, noting the advisor’s quarterly performance, their AUMs by age range, and the tasks they should be performing. Productivity tools that simplify routine tasks free advisors and personal bankers to focus on one of the most important parts of their job: building deep relationships with customers. Matt knows that his advisors can discover customer goals and help them accomplish those goals. And it doesn’t end with their customers: advisors can apply the same technology to extend those relationships across generations and households. Matt feels pretty great knowing Financial Services Cloud can help his advisors grow and succeed with supercharged productivity. He’s ready to take it for a spin. How about you?